The mystifying Double Barrel Cake. 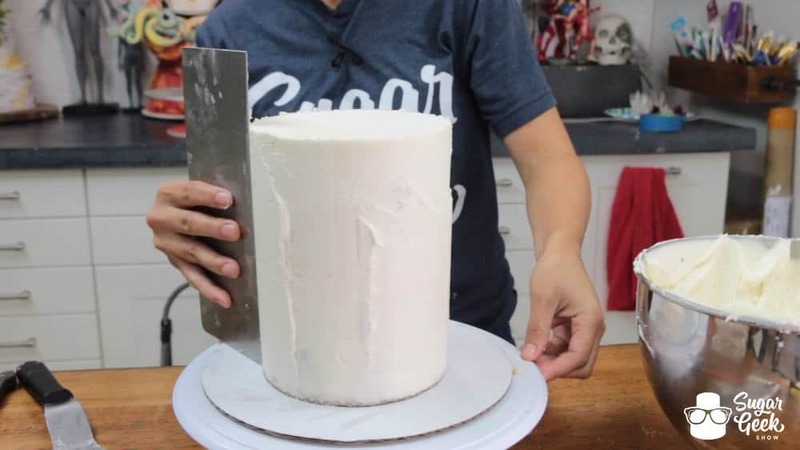 How in the heck do you make a cake SO tall?! With straight sides and a level top nonetheless?! Then always comes the question, “How do you serve a cake that tall? Aren’t the slices way too big? !” Alright, settle down. Today we are going to show you exactly how to create this mystical cake creature and I promise all of your questions will be answered. 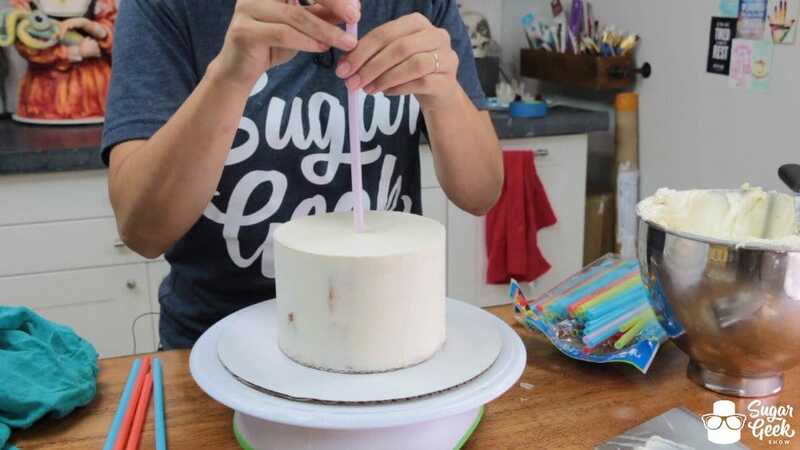 Take one of two (same-sized) cakes you’ve finished icing using the Upside Down Method and stick a fat milkshake straw STRAIGHT down in the center pushing it all the way to the cake board. 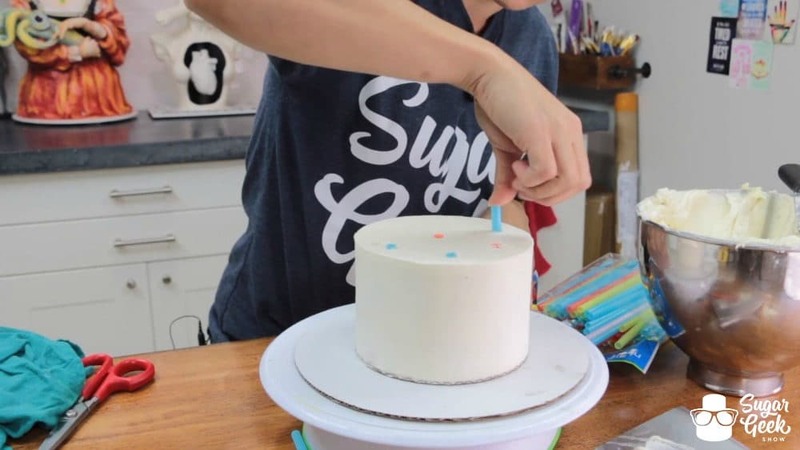 Measure the straw with your thumb at the top of the cake and cut it off at that mark. Be sure to cut as straight as you can. Use that straw to measure and cut your remaining support straws. 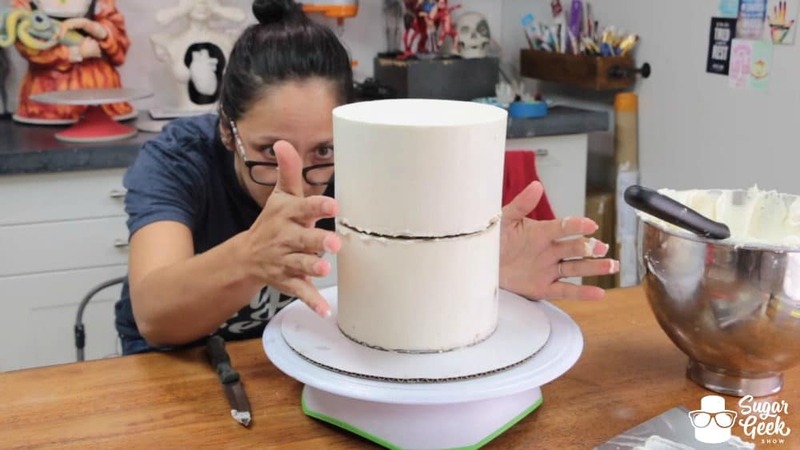 The general rule of thumb is to put the same number of supports as the size of cake that will be stacked on top of that cake. 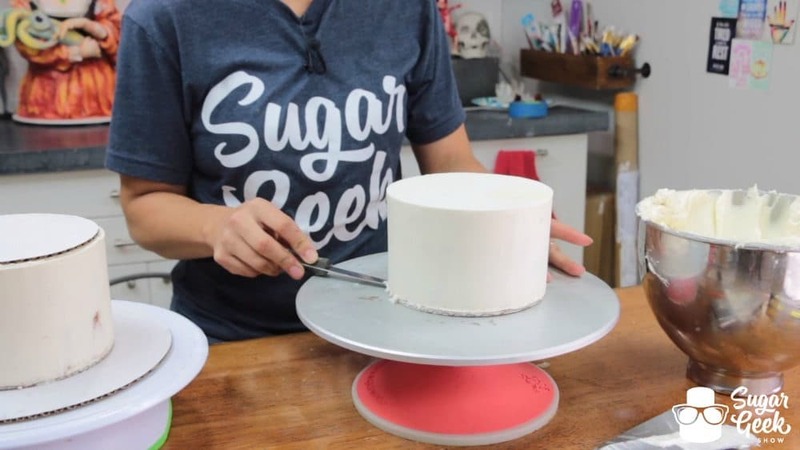 In this case we are doing a 6″ double barrel cake which is two 6″ cakes stacked on top of one another so we will be putting 6 support straws in the bottom tier. 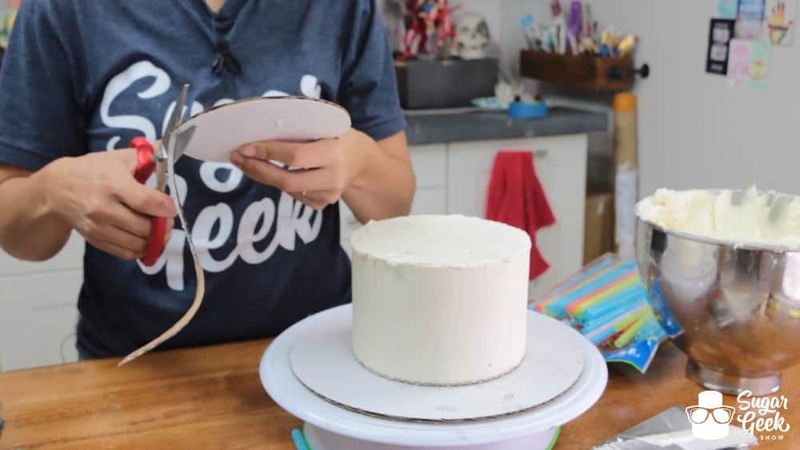 Place all of the support straws into the cake as evenly spaced as possible. You always want to put your supports as close to the edge of the cake it will be supporting as possible to get the most support. 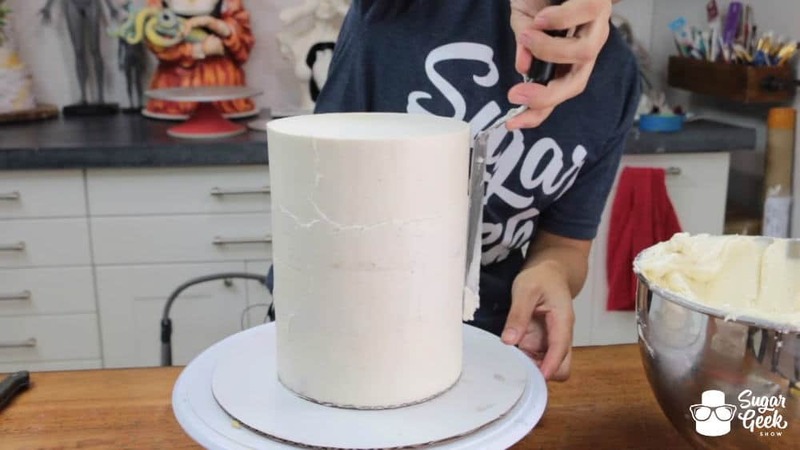 A mistake we often see beginners make is putting their supports too far in the center which can still cause the outside of your cake to collapse. About 1/4″ in from the edge is a good number to shoot for. With a double barrel cake you must be extra sure to place your straw straight down so that it doesn’t poke out the side of your cake. Placing one straw in the center is always a good idea. 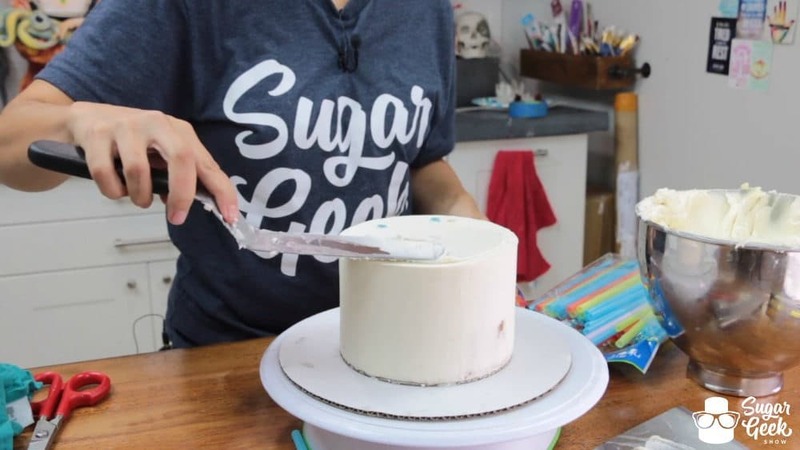 Cover your straws with a thin layer of buttercream to glue the next cake board on. 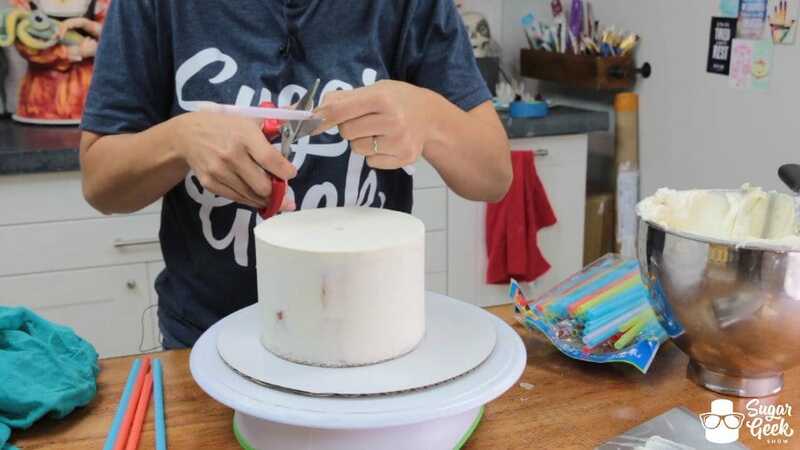 Take a cardboard round the size of the cake you are stacking and cut about 1/4″ off the edge, this way the board will not stick out or be seen in between the layers. Place the cake board on top of your bottom tier. Take your second finished cake and with a knife loosen the cake from the cake board you have iced it on. Peel the cake board away from the bottom of your cake. 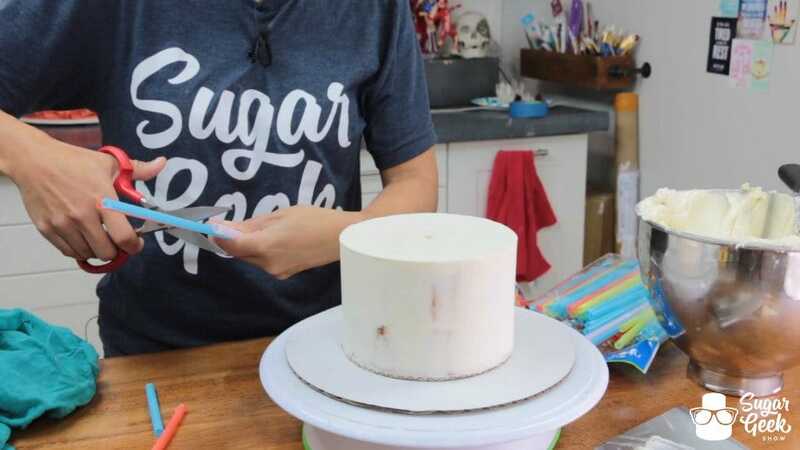 Because shortening and oil do not get firm when refrigerated you must use a butter cake iced with a real butter buttercream that has been chilled in the refrigerator until nice and firm. 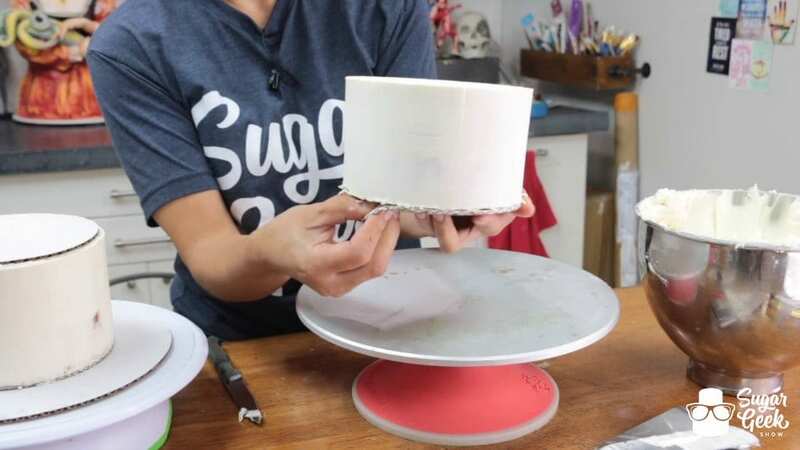 Once your original cake board is removed, place the cake onto the trimmed cake board you’ve placed on top of the supports in your bottom tier. Make sure the sides are lined up all around. Because we are using two finished cakes using the upside down method, the sides are already nice and straight and line up perfectly. Fill in the gap between the cake boards with some more buttercream. Using a tall bench scraper, smooth out the excess icing until smooth. 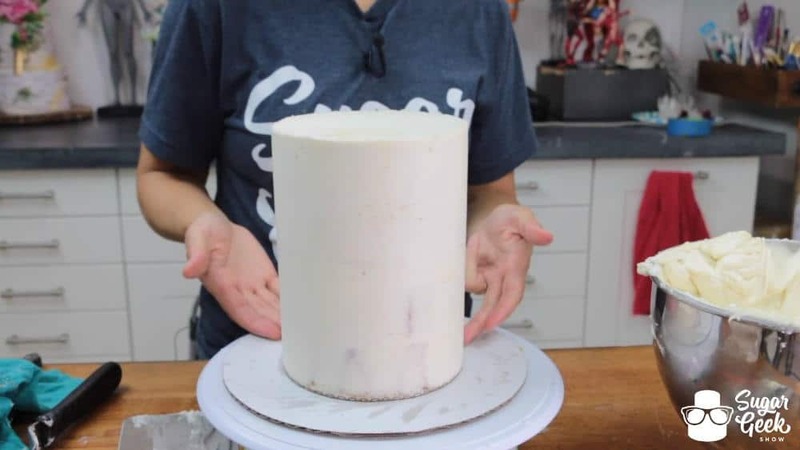 Add any additional icing in any areas necessary and continue smoothing until you have one cohesive, straight side and it looks like one ginormous cake. You should end up with something like this. Pretty sweet right? There is something mega cool about a ridiculously tall cake. 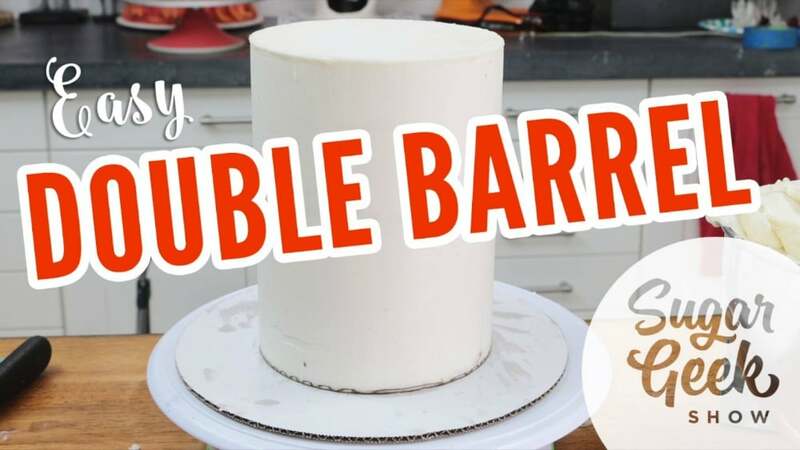 Now that you’ve been through the process you know that a double barrel cake is not actually one insanely tall cake that would be impossible to cut and serve but instead it is two regular sized tiers stacked on top of one another. So to answer the question of how you cut and serve this beast, well, you do it just as you would any other stacked cake. 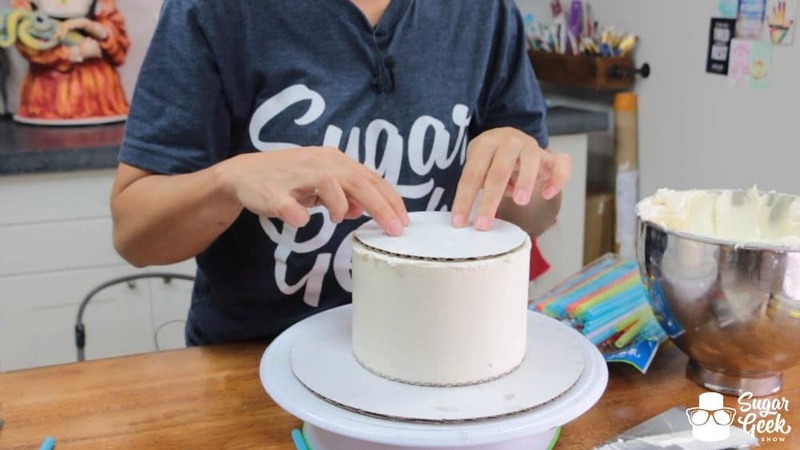 Cut and serve the top cake, remove the support board and cut and serve the bottom. No sweat. Let us know what your experience with double barrel cakes has been. Have you struggled getting them nice and neat? Have you been too afraid to try one altogether? Either way we hope this post helps your double barrel dreams come true! Next week’s post will show you how to cover this baby in fondant. Wanna see the basics in action? 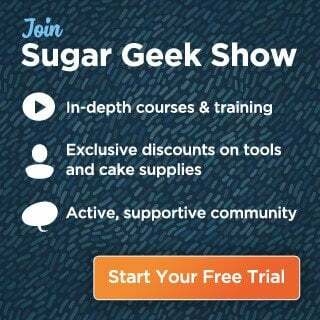 Don’t forget, the entire set of Cake Decorating Basics Video Tutorials are available to Premium and Elite Members of the Sugar Geek Show!